FcγRIIa amplifies platelet activation and greater platelet expression of FcγRIIa identifies patients at greater risk of subsequent cardiovascular events. Thus, platelet expression of FcγRIIa may be useful to guide therapy. Because platelet function tests are impacted by preparative procedures and substantial intra-individual variability, we examined the impact of these factors on platelet expression of FcγRIIa in blood from healthy subjects and in patients after myocardial infarction (MI). Platelet expression of FcγRIIa was quantified with the use of flow cytometry. 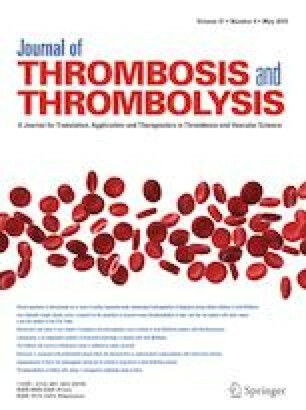 Blood was taken from healthy subjects and 114 patients after a MI in whom platelet expression of FcγRIIa was quantified before discharge and at 6 ± 1 months. Neither anticoagulants nor the antiplatelet agent cangrelor changed platelet expression of FcγRIIa. Intra-individual variation in platelet FcγRIIa expression was 8.5% ± 5% over the course of 1 month in healthy subjects. Platelet FcγRIIa expression was within 20% of the baseline value after 6 months in 71% of patients after MI. In summary, because FcγRIIa is a protein on the surface of platelets, assay conditions and antiplatelet agents do not change expression. Intra-individual variability in platelet expression of FcγRIIa is modest. Accordingly, platelet expression of FcγRIIa is a marker of increased platelet reactivity that can be reliably and repeatedly measured. This study was supported in part by a Grant from Janssen Pharmaceuticals, LLC. David J Schneider is named inventor on a pending patent application (Application No. : 14/403,337) that proposes the use of FcγRIIa for assaying platelet reactivity and treatment selection. The remaining authors have no disclosure.